Below you will find answers to our most frequently asked questions, if not, please don't hesitate to phone or email us, and we will answer your queries. 1 - How do I book a tour? The tours can be booked online, by email, or over the phone on: 0034 642 522 953. To secure a place on a tour you will be required to pay a deposit of 20% of the total cost and payment can be made by card, PayPal or bank transfer. 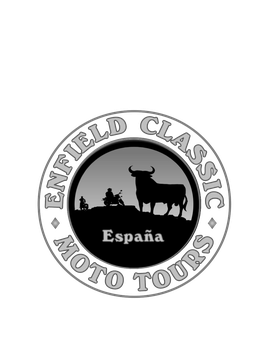 2 - Why should I book a tour with Enfield Classic Moto Tours? 3 - Can I pay in instalments? Yes! Whilst we believe our tours are good value for money, we also understand that any holiday can be quite a financial commitment. A growing number of customers like to pay in instalments, so give us a ring and we will be quite happy to come to an arrangement. We strongly urge you to take out some kind of holiday cancellation insurance in the unfortunate event of you being unable to come on tour due to unforeseen circumstances, for example an illness. We will accept staged payments/installments by paypal, however, staged payments made by credit card are subject to a handling fee of 2.5% per transaction. You will receive a booking confirmation, along with terms and conditions, the payment schedule for the tour and an invoice. The cost of the tour must be paid in full before any moto can leave our base. 4 - How do I get to Andalucia? There are regular flights into Malaga and Granada airports daily. Most of our clients choose to fly into Malaga (AGP) as it is the most convenient airport to our H.Q. We can arrange your airport transfers from either airport. 5 - Are flights included in the price? No, if necessary we can help arrange your flights but these need to be booked and payed for by our clients. 6 - Is food included in the price? You pay for your own lunch and dinner, on our Classic Local Tours, breakfast is included. 7 - Where do we eat lunch? We have stops along the way for fuel, beverages and toilet breaks. We usually stop for lunch between 1:30 - 2:30 and eat in a typical Andalucian restaurant. The average cost of a meal, including a drink, is around 15 Euros. 8 - Can you accommodate riders of all riding levels? We would recommend only booking a tour with us if you have at least two years' recent riding experience and can conduct a bike on steep gradients and tight bends, the main criterion, however, is confidence. On our first day out on a tour I can get an idea of your previous experience and organise the routes around this. We generally find most riders manage the road tours without any problems, however, if you are not comfortable riding a bike on steep gradients and tight bends this can cause problems while touring with a group and on our Classic Distancia Tours, as it will have an impact on those riders who have experience. For this reason we can offer you the choice of a private tour with the option of shorter and easier routes available, just remember we are touring on Enfields and want to enjoy the stunning scenery, the pace is naturally laid back. 9 - Can women participate on a tour? Most definitely, over the years we have noticed that more and more women are leaving the pillion seat and becoming riders themselves. We think this is brilliant and welcome women as riders or pillion. 10 - How long will I be expected to ride each day? Daily distances are dependent on the type of tour, road conditions, terrain and destinations but the normal is around 200 kms per day and between six - seven hours in the saddle. We don't normally use motorways but sometimes it is necesary to avoid towns or cities where tour members can be separated by traffic lights and junctions. We always aim to arrive at our base with time to relax before your evening activities. 11 - What kind of motos do you have? Our regularly serviced and maintained fleet includes 350cc and 500cc Classic engine and UCE powered Royal Enfield Bullets. 12 - Do you hire out motos? Yes, we have a fleet of classic BMW's which we hire out regularly. If you have already toured with us before or book a one day guided tour with us and show that you are a competent rider then I have no problem hiring out a UCE Bullet for as long as you like, (a deposit of 600€ is required). 13 - Does my moto rental include Insurance? On arrival at our Guesthouse you are required to pay an Accidental Damage Deposit of 500€ (or equivalent if you prefer to pay in your local currency) in cash to cover damages to any of the motos. This will be returned in full at the end of your tour, provided no damage has been caused. 14 - What other paperwork do I need? 15 - Where do I get an I.D.P.? You will need to enquire about and apply for an I.D.P. locally. 16 - What items do I need to bring? You will probably not require as much as you think, but you will receive a list of "What to bring" with your confirmation email after you have booked. This will give a list of essential and non essential items. 17 - What riding equipment can you provide? We have some flip front, full and open face helmets, gloves, jackets and trousers in the following sizes (S,M, L & XL). If you wear extra small or XXL sizes, you will need to bring some of your own equipment. Most clients choose to bring their own riding gear anyway, for comfort and hygiene reasons. Small rucksacks (20L) and/or saddle bags can also be provided. 18 - What kind of accommodations will there be when I am on a Classic Distancia Tour? You will generally stay in clean and comfortable three and four star hotels/B&B"s (some have swimming pools). However, in order to operate our tours through the most beautiful routes, in some places we will stay in remote guesthouses, which are a bit more rustic in nature (casa rurales). However, you will always have a shower, a delicious meal and a clean bed at the end of the day. Your tour price is based on double occupancy, which means you will be sharing a room with another client. If you would like to have a room for yourself, this can be arranged for a supplementary fee. 19 - Can I request my own itinerary? If you are coming with a group of 4 riders and you would like to request a specific itinerary that is different to our normal one, please contact us and we will discuss with you the feasibility of the itinerary you are requesting. It is possible that we might be able to accommodate your proposed itinerary, depending on the distances covered, the availability of hotels, and the logistics involved. Please understand however that the cost will probably be more than our standard tour price because there may be extra exploration and setup expenses. Having said this, we believe that our standard touring holidays will give you the greatest satisfaction. We have spent a great deal of time exploring Southern Spain and putting together our itineraries. We know where the best places are to ride so that you will have an unforgetable holiday full of spectacular scenery and comfortable nights. 20 - What happens on ‘rest’ days? We usually allocate rest days where your time is your own, so please feel free to do as you wish. You may just want to wander the local town/village and sample the local beers/wines and tapas. We can suggest some possible places of interest to visit or activities to take part in. Sometimes there are guided tours, which you are welcome to join, (these are not always in English). 21 - What happens if it rains? Here on the costa tropical we are blessed with an average of 320 sunny days per year and an average temperature of 20°C but some days we are lucky and we have rain. On a very rare occasion we will have two consecative days of rain. If you are fortunate enough to be here on one of these lucky days when it does rain and you decide to postpone that days touring, you will receive the full rental cost of your moto for that day. We can also arrange some alternative activities and travel by car or van. Come and book your next tour with us today! You will not be disappointed!